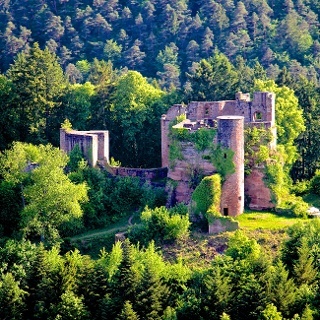 Photo:	Jacques Noll, Südwestpfalz Touristik e.V. The 18.6 kilometers long Dahner circular walk for over narrow paths and varied forest trails through the diversity of the Dahner Felsenland. Starting with the rock massif Hochstein, the castles group Alt-Dahn, the Roman rock over the Jungfernsprung and Satan's boulders to the castle ruins Neudahn. On the nearly 18.6 kilometers of the Dahner Rundwanderwegs reveals the diversity of the Felsenland. Over the rock massif Hochstein leads the way to the largest castle complex of the Palatinate, the castle massif Alt-Dahn-Grafendahn-Tanstein.Hier should allow time for a comprehensive visit. Comfortable forest paths lead over the Roman rock, with its great 360 ° view, to the famous rock massif Jungfernsprung above the town of Dahn. The story continues on the other side of the valley, past the rocks of Satan's lump and witch's mushroom to the imposing castle ruins of Neudahn. After a short descent into the nature reserve Moosbachtal, a stop at the Dahner Hütte of the Palatine Forest Association is a great opportunity. Two impressive rock massifs are passed before the path ends in the spa park, at the starting point of the round trip. 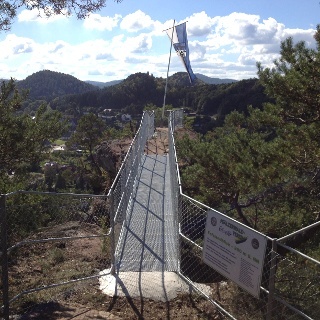 This is a new premium route, which was certified in autumn 2015 by the German Hiking Institute. The Dahner Rundwanderweg is one of the Felsenland tours in the Dahner Felsenland, the premium hiking region. Our total of twelve premium trails are listed both in the Pfalz hiking menu, as well as the hiking arena Palatinate Forest Northern Vosges. 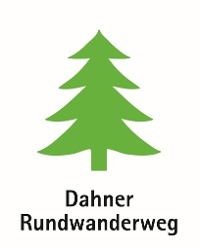 Furthermore, the Dahner Felsenland is a member of the Premium Wanderwelten. Despite the well-signposted trail markers along the premium hiking trails, we recommend for security reasons to always have an appropriate hiking map so that, for example when a storm occurs, you can quickly either find shelter or get out of the woods. Especially in the autumn it is also important to remember that leaves lying on the ground can conceal irregularities, such as roots, rocks or holes in the path. Following storms, trees can have been uprooted or have branches hanging down. Such path impairments have to be expected when using such trails . Especially in adverse weather conditions, it may occur that the trails and paths turn into muddy and slippery passages. Path impairments of this kind have to be expected when you go out for a hike. Not all rocks or slopes are secured with ropes or railings and sure footedness is required. Should you be of the opinion that these are not accessible to you then you should try and get around them. Sturdy footwear and all-weather clothing, sun and rain protection, and a sufficient quantity of food and drink, should no refreshment facilities or shopping possibilities exist or be open. Although the path is always very well marked, you should for safety reasons always have an appropriate hiking map with you. 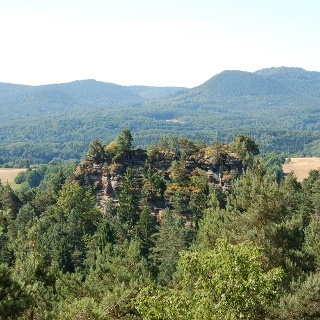 This approximately 18.7 km long circular trail, the Dahner Rundwanderweg, which can be divided into two sections, is certainly one of the most beautiful and interesting hiking trails in the Palatinate. It leads around the spa town of Dahn through a world of bizarre rock giants and mighty castles, through vast forest areas as well as alongside romantic flooded plains and lakes. The start is in the spa park of Dahn . 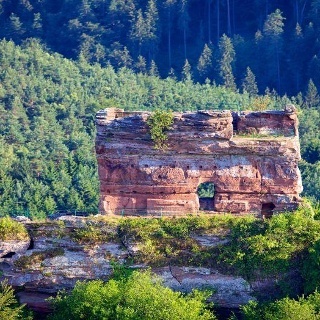 Over the mighty rock formation of the Hochstein, from the top of which the hiker has a wide view over the Dahner Felsenland, the trail leads to the largest ancient castle in the Palatinate , the "Altdahn-Grafendahn-Tanstein". A visit to the castle museum can be highly recommended. 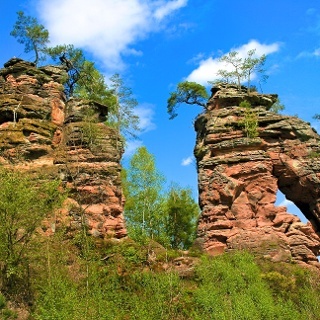 The next imposing stopover on the tour is the rock formation “Römerfelsen”. A ladder leads up to the secured viewing platform on the rock. Here the hiker has a great view over the treetops of the Palatinate Forest . Now on easy forest paths we cross the Lachberg, with views of the castle of Altdahn , past mighty rock walls and over the ridge of the Vogelsberg to the Aussichtskanzel on the famous rock formation "Jungfernsprung", just above the town of Dahn . After a short descent, we reach Dahn again and here ends the first section of the tour. Now the way leads to the other side of the valley to the viewing platform on the rock formation “Sängerfelsen”and further, past the rock formations of the"Satansbrocken" and “Hexenpilz”, to the mighty castle ruins of "Neudahn" with its towers and rock chambers. There follows a brief descent into the nature reserve Moosbachtal, which will delight nature-loving walkers. Past several small lakes we soon reach the "Dahner Hütte", a tavern run by the Palatinate Forest Association. 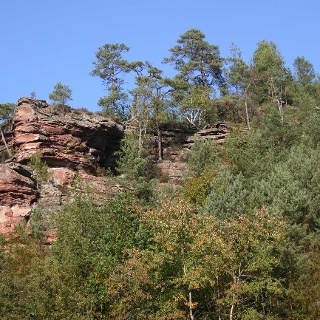 After a comfortable rest surrounded by breathtaking scenery, we walk along beautiful forest paths to the rock formations "Braut und Bräutigram” and "Wachtfelsen" in Dahn. 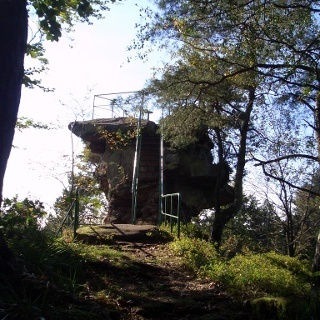 The trailblazers amongst you now have the opportunity of climbing up to the observation deck of the Wachtfelsen, via a ladder. The path now leads back through Dahn to the starting point in the park. Typische Tour im Pfälzer Wald! Jeder Höhenmeter lohnt sich! Eine tolle Aussicht toppt die nächste. Auch die Burgfreunde kommen auf ihre Kosten! Und bei wärmeren Temperaturen kommt man doch schon ins schwitzen! Herrlich welche Vielfalt der Pfälzer Wald rund um Dahn zu bieten hat ! Gerne kann der Rundweg auch individuell gestaltet werden, durch viele kreuzende Premiumwege! Ein sehr abwechslungsreicher Wanderweg. Es gibt viel zu sehen. Kein "Flip-Flop-Pfad", da der Boden größtenteil steinig und wurzelig ist. Der Nachteil an der Tour ist, dass man die überwiegende Zeit den Verkehrslärm in den Ohren hat und somit wenig Stille genießen kann.